SEIU Local 500 had over 8,000 members and a $5.8 million budget in the year ended 9/30/17. Its biggest categories of membership are MCPS support staff, childcare workers and adjunct professors. Its endorsement is highly valued by MoCo politicians and it has a respected political program. As it has grown over the years, it has become more of a statewide organization in contrast to its roots as a MoCo public employees union. It has had great success organizing adjunct professors and its top state legislative priority in recent years has been a bill allowing community college employees the right to organize. 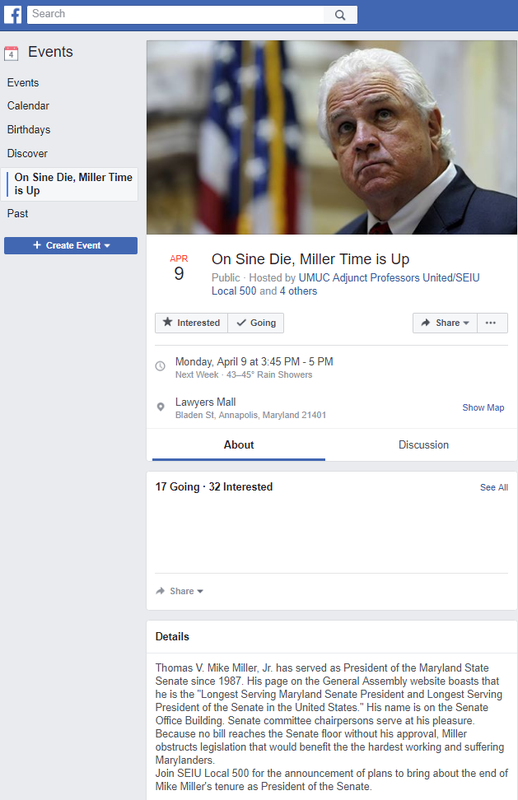 (Currently, collective bargaining is prohibited at most Maryland community colleges.) The bill has died several years in a row and most recently was withdrawn by its Senate sponsor, Guy Guzzone (D-13). The union blames Mike Miller for not only killing this bill but also blocking other progressive legislation over the years. Two other sore spots for progressives are the General Assembly sexual harassment bill, which passed the House on a 138-0 vote but has not moved in the Senate, and the $15 minimum wage bill, which has not moved in either chamber. Also, progressives have not forgotten Miller’s support for the Roger Taney statue on the statehouse grounds. To be fair, other liberal priorities in the past like marriage equality, the abolition of the death penalty, gun control, the DREAM Act and sick leave could not have passed without Miller’s support – or at least his acceptance.